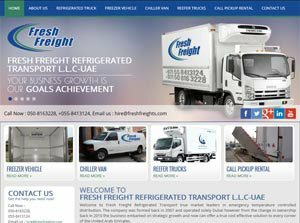 Fresh Freight Refrigerated Transport L.L.C is a UAE based company. It provides Emergency Temperature Controlled Distribution Services. Formed in the year 2007 for catering to clients’ needs solely in Dubai, the company’s ownership changed in the year 2010. Today, it provides cost effective Emergency Temperature Controlled Distribution Solutions to clients in every corner of the United Arab Emirates. The PHP Web Development, Static Web Designing and Linux Hosting of the company are done by WeblinIndia.net – a well-renowned India based SEO Company.